In this, the third in the Poppies trilogy, Mercy Dog Flo, has more to contend with than racing across dangerous battlefields. Can she reach the injured in time with her first aid kit, and can she lead Ray and the ambulance unit to the injured? Flo Of The Somme pays tribute to the remarkable bravery of the pigeons and animals who risked their lives during World War 1. 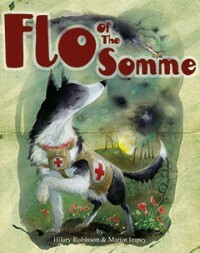 Following on from their lyrical picture books Where the Poppies Now Grow and The Christmas Truce, the same team now give us Flo of the Somme, which tells of the service and courage of animals during the First World War. The book is timely as the centenary of the Battle of the Somme will be marked in 2016. Once again the author and illustrator show skill and sensitivity in presenting to children true stories set in the difficult context of conflict. The rhyming verse echoes the structure and rhythm of the traditional nursery song This is the House that Jack Built – a sympathetic way of helping young readers connect with the story without detracting from the serious message. It is made clear that the animals helped to save many lives and they had no choice about risking their own safety. Flo, a mercy dog, who carried medical kit over the battlefields to the wounded, worked tirelessly with soldiers in the Medical Corps. Some of the horror and suffering war involves is communicated in the affecting illustrations. For example many show the difficult conditions on the battlegrounds made worse by inclement weather and appalling mud. They bring home also that there is something moving about people and animals working together to bring help to the casualties of war. With great tenderness a soldier holds a carrier pigeon, shot in the wing as it flew through danger to bring a message, while one of the later spreads shows soldiers and nurses saluting the animals who had given so much. This book would be a welcome addition to resources to support a project for older primary children studying the First World War. Would younger children cope? A true story about animals nearly always has appeal and I think children aged six or seven perhaps would be able to appreciate listening to it read aloud. The book is in large enough format for the sharing adult to show the detailed and involving illustrations which reveal our debt to the effort of animals in the First World War.